Many of the 1960s hairstyles were in transition from the big hair of the 1950s and headed towards the frizzy and out of control look of the hippie age. 1960's began with crew cuts on men and bouffant hairstyles on women. Beehives, flips and bobs were incredibly popular. Take our 60's Pop Quiz Challenge. 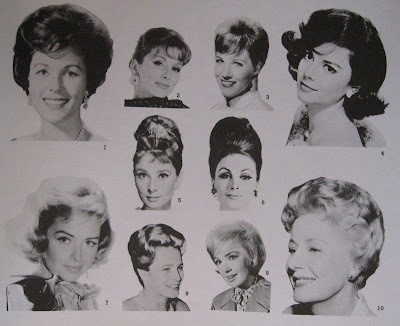 These were the 10 Best Coiffured Women of 1963. Who are they? Answers provided on Monday!